Every day, while you are busy managing the everyday running of your property, stains are building up silently. Visible staining does not always appear all at once, but layers over itself until it is hard to ignore. Instead of dealing with grime, dirt, growth or even graffiti, call in a Gorilla to save the day! Our team of Gorillas are working cross-country to keep each city and province looking its best. It can be easy to become caught up in simply accepting things the way that they appear. Over time, it can be difficult to see through the surface area and to remember how things used to look. Clearing away one small portion of a stain can be a great reminder of how your deck, retaining wall, or concrete used to look but a few chunks of clean space are not enough. Clearing away a large space takes time and technique that not everyone has. An itchy trigger finger can clear away a small space, but it can cause a great deal of damage if used incorrectly. Don’t bother taking a risk with your property when it is so easy to call in a Gorilla for help. Because our Gorillas are local to your area, you will never be left waiting for results. Prompt service is a key feature of our Gorillas, but so are our results. By treating surface stains first, the eyesore is removed while the actual cause becomes all the more apparent. Cause and symptom both need to be treated in order to get the right results for any type of property. Communities all across Canada are dealing with dreaded dry spells. A lack of rain in the forecast might be stealing focus but now is the perfect time to deal with outdoor drama. Drier climates tend to see more organic debris dislodged and spread out over properties. This might clutter up lawns but your gutters are also filling up. As soon as dark clouds start to form, you will find yourself overloaded with a full eavestrough and nowhere for water to drain! This might sound troublesome, but you can avoid all of that with a little help from a friendly neighbourhood Gorilla! A professional gutter cleaning service will make sure that your drainage system is running smoothly all year long. It can be difficult to notice when your gutters are becoming clogged. Every last piece of debris that makes its way into your system contributes to a future blockage. Obviously smaller pieces of debris will take longer to accumulate and become obvious but larger items can be instant trouble. It is easy to let the condition of your gutters fall to the wayside but this can lead to water damage, leaks, flooding, mould and even pest infestation. By making your eavestrough cleaning a semi-annual affair, you can avoid damage and get the full lifespan out of your gutters. 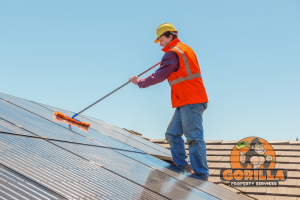 In order to get the best results for your eavestrough cleaning, our Gorillas operate using top of the line safety features and tools. By using vacuums instead of just hands, even the smallest pieces of debris are sucked up and disposed of. 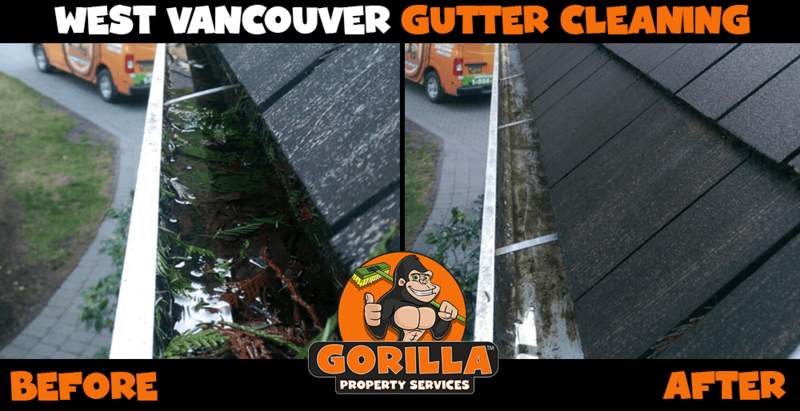 When you want the best results for your gutter cleaning service, all it takes is one phone call to a Gorilla. Call today to book an appointment to keep your drains, draining and your gutters clean! As the weather gets warmer, it is easy to be distracted by the great outdoors. Canada is known for having one of the most beautiful landscapes in the world, so it is no wonder that you want to go out and explore! With all of these great things on your to-do list, it is easy to forget chores at home. Your home or workspace will survive the occasional forgotten dish or unswept floor, but clogged gutters can mean real trouble. From the outside, a clogged or blocked gutter system might not seem like the end of the world but a bit of debris can cause a ripple effect throughout your property. Rain does not stop falling and moisture does not stop collecting just because you haven’t been able to empty out your gutters. Opened eavestrough systems collect fallen and dislodged debris kicked up by wind or discarded from surrounding plant life. The more that falls, the more that layers over itself and the more dense your clogs become. With nowhere to go, water simply sits. Sitting water is a great home for mosquitos or other pests. In addition, this water adds weight to fixtures and can pull them away from their attachments. As sitting water adds up, it can rest up against construction materials, softening them and wearing away at them. This means leaks, water damage and even flooding over time. By combining both elbow grease and state of the art technology, our Gorillas are able to get the best results for your gutter cleaning service. There are plenty of reasons that can’t handle your gutter cleaning all on your own, but that does not mean that you have to live with a clogged drainage system. Our Gorillas are outfitted with all the right safety equipment, training and vacuums to clean blockages out of every pipe and downspout. If you are noticing slow draining from your system, an eavestrough cleaning is in the cards for you! By making your gutter cleaning a part of your home maintenance routine. Twice annual maintenance can make a world of difference to your gutters! Property owners need to work hard to keep their residential or commercial spaces clean and inviting. This is tricky enough on a good day, but when you are going up against nature – or vandalism – it can be overwhelming! A clean property is a top priority for most owners, but everyone needs a helping hand once in a while. When you call in a Gorilla, you are getting well-rounded services for your home or workspace. The first impressions of your property are all based on aesthetics. Something as simple as a cloudy or dirty window can be unappealing to visitors or traffic. 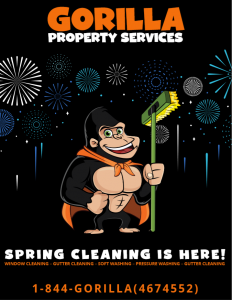 With a ton of industry experience behind our home maintenance experts, our Gorillas can wipe, scrub and polish your property to perfection. Chores such as pressure washing or graffiti removal can maintain the look of your exterior walls or concrete. Over time, a lot of moisture or humidity means unwanted staining or growth. Blasting away algae with a pressure washer sounds like a great idea but without knowing how to use it, the process can cause damage. Trust a Gorilla technician to get your windows clear, your decks clean and your graffiti gone. When you want your property to look its best, a combination of services can give new life to your residential or commercial space. There are dozens of pest control companies out there, but none are as committed as our Gorilla technicians! Prompt, professional service by a local company is only a phone call or click away. Now that snow has begun to melt away, the surfaces around your property are starting to show. Things that have been covered up or buried for the last few months are finally seeing the light of day – and they are not always a great sight. Green grass is always welcome but seeing green across your rooftop is a real problem. If you find yourself dealing with unwanted growth, have a Gorilla help with a roof cleaning and moss removal service. Roof clutter does not look great, even at the best of times. In addition to looking terrible, organic clutter holds on to moisture. This moisture paves the way for unwanted growth; moss in particular! When moss begins to take root on your roof, there are nothing but problems to follow. Moss spreads around shingling, damaging materials as it goes. At its best, your roof can withstand a lot from the outside elements but when materials are softened or damaged, a roof can’t do its job. The best way to keep moss and roof clutter at bay is to make your roof cleaning and moss removal, a routine operation. Twice annual maintenance limits growth and makes a healthy lifespan for your roof. Not every property will have the same rate of growth. Shade, surrounding plant life and climate all play a role in the condition of your roof. If you are unable to make the climb for decluttering, just have a Gorilla handle it for you. As spring is beginning to peak out from behind winter’s shadow, everyone is keen to get outside. The nights might still be chilly but that does not deter graffiti artists from hitting the streets. Problems with spray paints are not seasonal and can pop up at any given time! You might go to bed with clean walls or windows, only to wake up and find an unwanted design. Your home or storefront might have kept you warm throughout winter, and now it is time to return the favour with our graffiti removal services. Spray paints are easy to come across. There is hardly a department or hardware store around that does not sell aerosol paints in one way or another. These tools are easy to transport, light to carry and a real problem for property owners. Since we can’t get rid of spray paint as a whole, we need to learn how to deal with them! Over the years, our Gorillas have dealt with all every sort of paint type on every sort of exterior and developed a plan to handle them all. When you are in need of graffiti removal, the key to success is having the right team in your corner. Over the years, our Gorillas have developed a multi-step process to get rid of graffiti on any surface. By combining Gorilla Foaming Cleansers, elbow grease and a bit of creativity, our Gorillas are always working to keep our community clean. Don’t spend another day advertising any unwanted designs when our graffiti removal services can have your home or storefront looking great in no time at all! Call today to book an appointment with one of our Gorillas. Moisture is a real problem for Canadian property owners. Your roof and walls might do a good job keeping it out but it leaves them worse for the wear. When it comes to combatting rainy weather, the most valuable tool that you have in your arsenal is your gutter system. Whether you call it a gutter or an eavestrough, the perimeter drain system running along your roof is vital to the smooth running of your property. As important as these fixtures might be, they are difficult to keep clean. 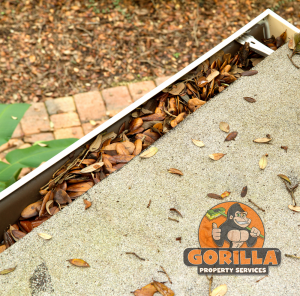 Instead of struggling with slow draining or impassable gutters, call a Gorilla for your gutter cleaning service. Over the course of the year, all different types of debris fall to the surface of your roof. Most roof shapes are designed to let this clutter roll off of surfaces, but this often means that it is also directed right into your gutter system. With both opened and unopened areas, your eavestrough collects seed pods, needles, leaves, sticks and even pests. This creates blockages in reachable and unreachable areas that just cannot be removed by hand. When it comes to conquering your clogged gutters, our Gorillas have all the tools, technique and training to get the job done right. Using high-powered vacuums can remove small to moderate items, while the larger pieces of debris are pulled out with paws. Once your system appears to be clear of all major blockages, pipes and downspouts are water tested. By confirming that water is free-flowing, our Gorillas can be sure that there is nothing hiding out behind the scenes. Call today to speak with one of our Gorillas and get the ball rolling on your gutter cleaning.